Writing a biography of Arturo Toscanini is beyond the scope of this webpage. As recently as 2007, on the occasion of the fiftieth anniversary of his death, plenty has been written and spoken about him over a long period of time. He was the most famous student ever to graduate from the Royal School of Music of Carmine. of the Philharmonic in New York. In 1931, after an act of fascist violence, life in Italy became intolerable for him, he then left the county to return after the war, directing the inaugural concert for the reopening of Teatro La Scala which was rebuilt in the aftermath of the war's destruction. On 16 January 1957 he died in Riverdale, NY, United States. 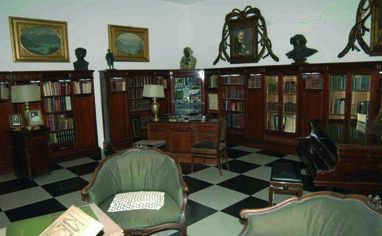 In 1976, on the occasion of the celebration of the 150° anniversary of the foundation of the Conservatory, the daughters of Toscanini, Wanda and Wally, donated to the school where their father began his career in music, the home study of the maestro located in the building of via Durini in Milan. Among the rich book collection, many volumes of which were glossed by Toscanini himself, of primary importance are the numerous works on Richard Wagner written in several languages that the maestro habitually read. The furniture is comprised of a piano, bookcases, display windows, a writing desk, chairs, and a small sofa with armchairs. - a half-length bronze portrait of Otello covered by a mantle of gilded decorations, work of G. Wagner, winner of the First Prize of the City of Paris competition. - Landscape with lake, another oval oil painting by Vittore Grubicy De Dragon, framed in gilded wood. 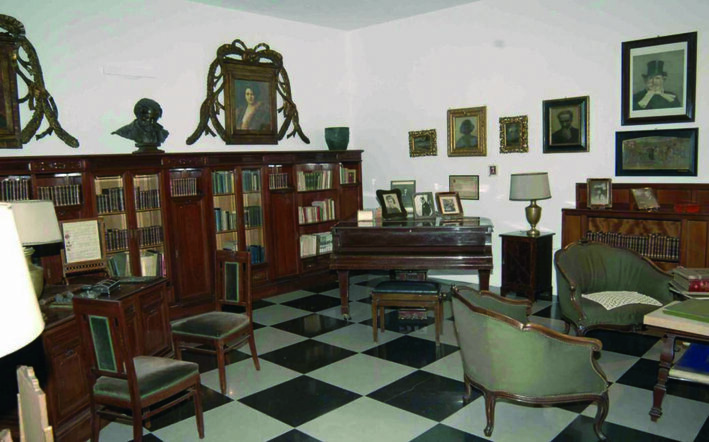 To the right: home study of Arturo Toscanini.